I Love Being a Nun! While this post is entitled, “I Love Being a Nun!”, actually I am a sister. Nuns are those who are cloistered and primarily involved in the ministry of prayer. Those of us who are sisters are involved in apostolic ministry – and that’s a big umbrella (teaching, hospital ministry, parish ministry, social work, working for social justice, etc.). So, it would be more correct for me to say, “I love being a sister”, which I do often. But since people often call sisters nuns . . . Anyway, nineteen years ago today I entered the convent and started the process of becoming a Dominican Sister of San Rafael. I made my first profession of vows in 1996 and my perpetual vows in 1999. And while nineteen is not one of those special numbers like 20, 25, or 50, it still seems pretty significant to me. I was 40 years old when I entered (I guess you can do the math). And I still love being a sister. My family tells me that they have never known me to be happier. Living in community – doing work that is satisfying and of benefit to others – praying together with a community of sisters on a daily and regular basis – being encouraged to continue to study . . . to be all we can be (for the sake of others) . . . What can I say but that I am grateful! I highly recommend this life to others! 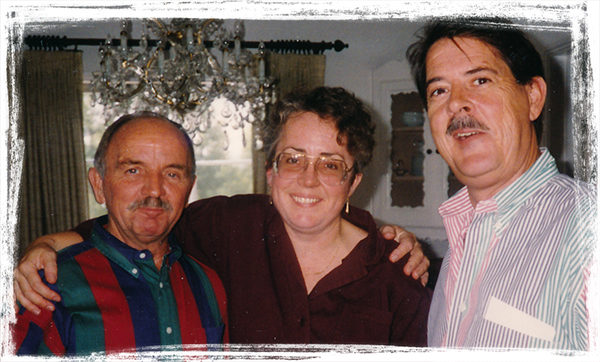 Here I am with John and Don, a couple of friends, at a party prior to my entering the convent. 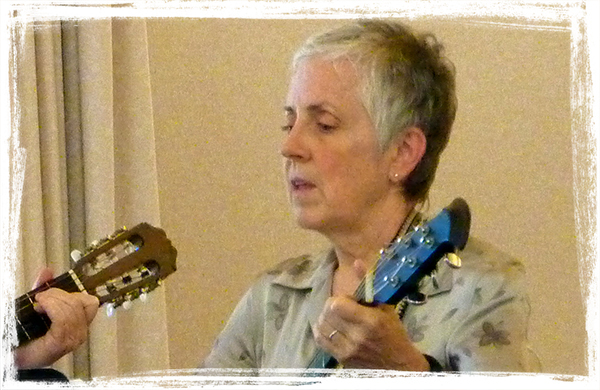 Here I am playing the guitar at a ceremony for Sister Alexa, our newest novice, just a couple of weeks ago. Congratulations, Pat! ‘Tis a good life! I celebrated my 25th Jubilee on the 12th, and it was a glorious celebration! May you celebrate many more anniversaries! Good to hear from you, Michelle! Congratulations to you. It’s still a ways of for a jubilee celebration for me, so I’m happy to flag the markers on the way. You are so right, ’tis a good life, and we are blest. Are you still in leadership?